There is a need to lay down the procedures for awarding and managing grants intended to contribute to the funding of political parties at European level. 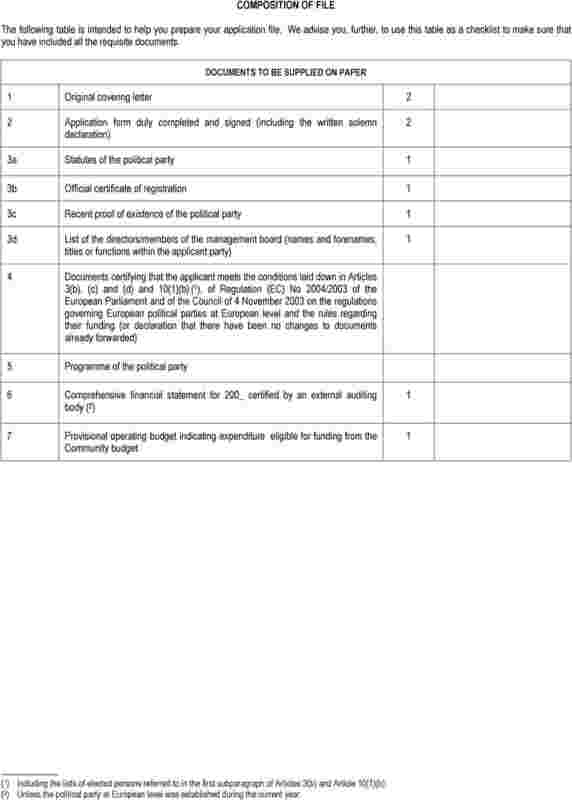 These rules lay down the procedures for implementing Regulation (EC) No 2004/2003 of the European Parliament and of the Council of 4 November 2003 on the regulations governing political parties at European level and the rules regarding their funding. 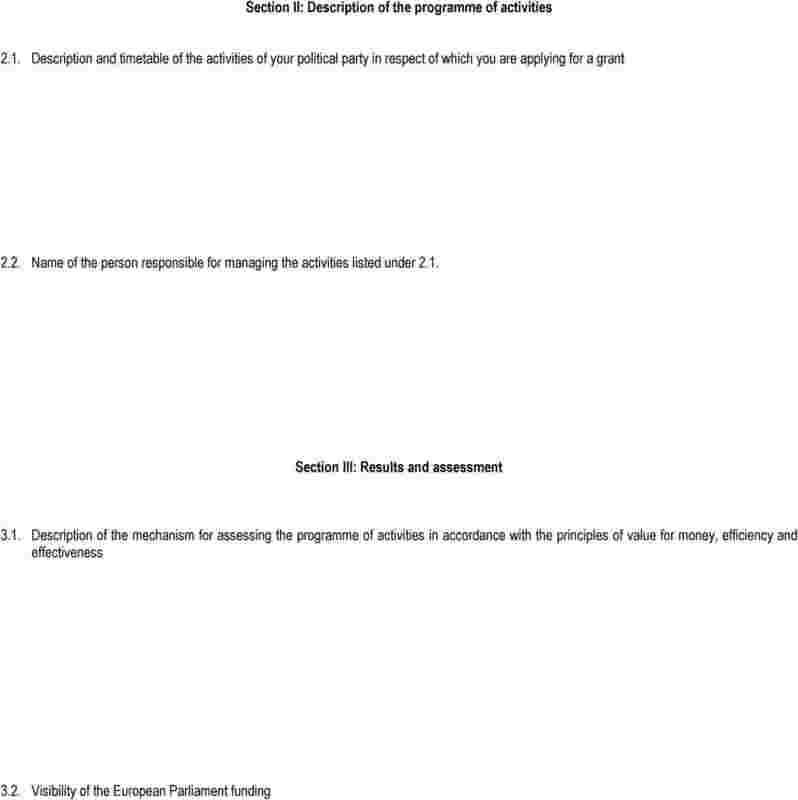 The European Parliament shall publish each year, before the end of the first half of the year, a call for proposals with a view to the awarding of grants to fund political parties at European level. The published document shall set out the eligibility criteria, the arrangements for the provision of Community funding and the proposed timetable for the award procedure. 1. 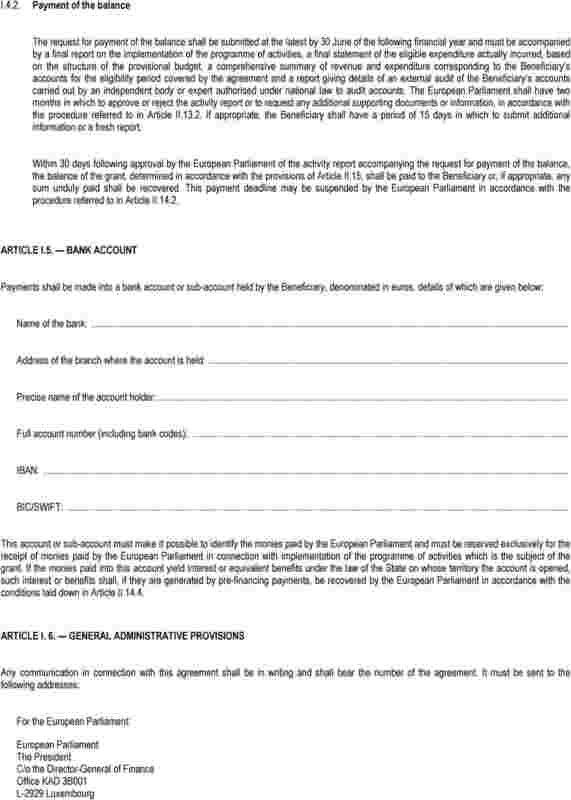 For the purposes of implementing Article 4 of Regulation (EC) No 2004/2003, any political party at European level wishing to receive a grant from the general budget of the European Union shall submit a written application to the President of the European Parliament prior to the 15 November preceding the financial year in respect of which the grant is being requested. The conditions laid down in Article 3 of Regulation (EC) No 2004/2003 must be met on the date when the application is submitted. 2. 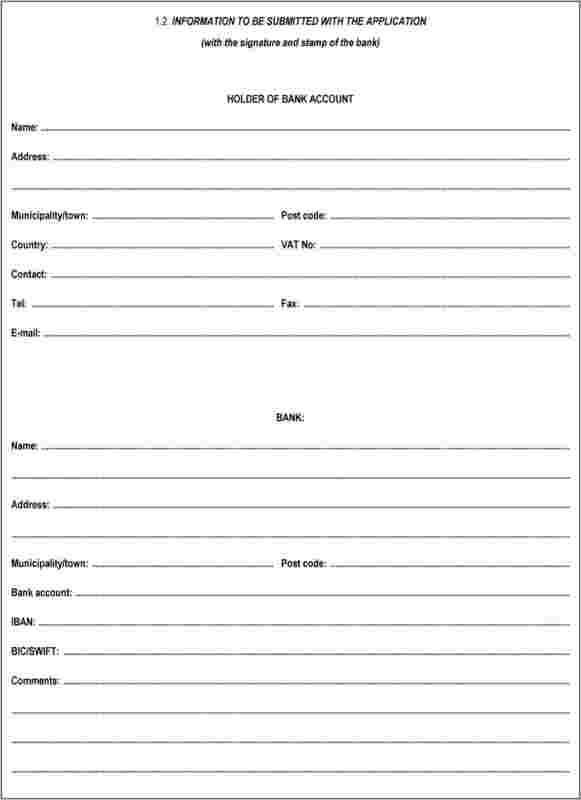 The grant application form is annexed to these rules (Annex 1). It is available on Parliament's Internet site. 3. 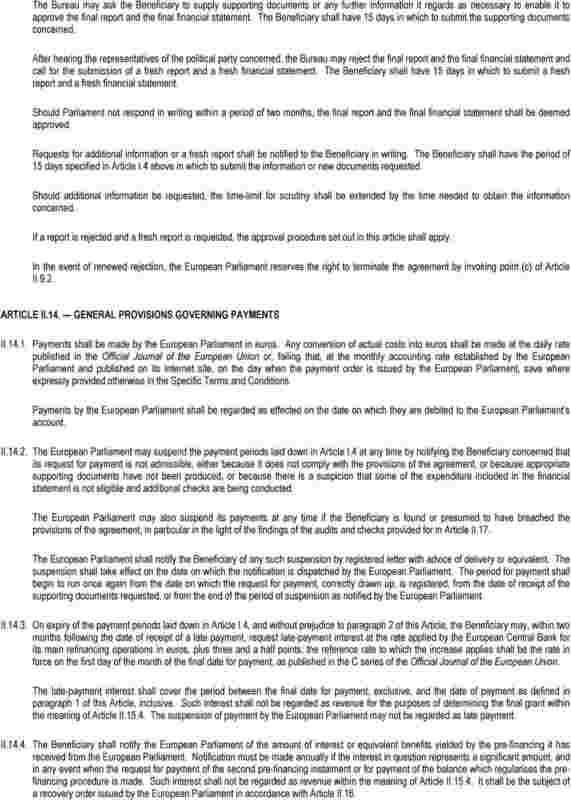 All notifications pursuant to Article 4(3) of Regulation (EC) No 2004/2003 shall be forwarded to the President of the European Parliament. 1. On a proposal from the Secretary-General, the Bureau shall assess funding applications on the basis of the criteria laid down in Articles 3 and 4 of Regulation (EC) No 2004/2003 with a view to determining which applications are eligible for funding. 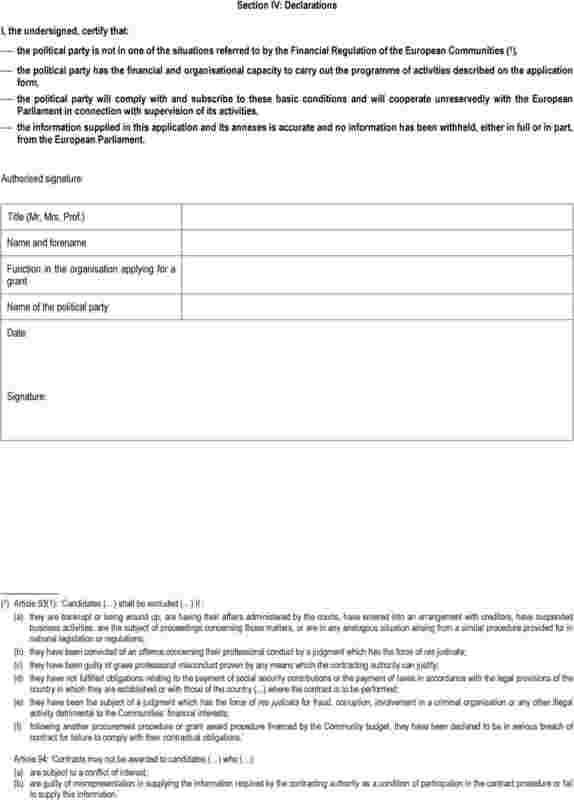 The Bureau and, when the Bureau decision is being prepared, the Secretary-General may ask an applicant to submit further supporting documents or to clarify the supporting documents attached to the application, by a deadline which they shall lay down. 2. Before 15 February of the financial year in respect of which the grant is being requested, the Bureau shall draw up the list of beneficiaries and the amounts of the grants awarded. Should a grant application not be approved, the Bureau shall set out in the same decision the grounds for rejecting the application, in particular in the light of the criteria laid down in Articles 3 and 4 of Regulation (EC) No 2004/2003. The Bureau decision shall be adopted on the basis of the assessment provided for in paragraph 1. It shall take account of any changes which have occurred in an applicant's situation following submission of the application, on the basis of notifications received pursuant to Article 4(3) of Regulation (EC) No 2004/2003 and changes which are common knowledge. 3. The President shall inform applicants in writing of the action taken on their applications. In cases where an application has been approved, the notification shall incorporate, as an annex, the draft grant award agreement to be signed by the beneficiary. In cases where an application has not been approved, the notification shall include the grounds for rejection set out by the Bureau. Applicants whose applications have been rejected by the Bureau shall be informed of that fact within 15 calendar days following notification to beneficiaries of the decision to award a grant. 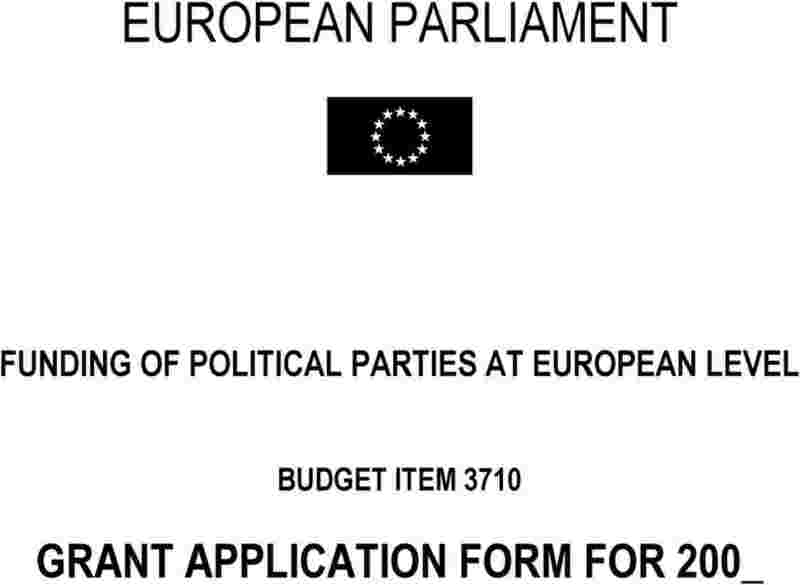 A grant awarded to a political party at European level shall be the subject of a written agreement between the European Parliament, represented by the President or his or her delegate, and the beneficiary. 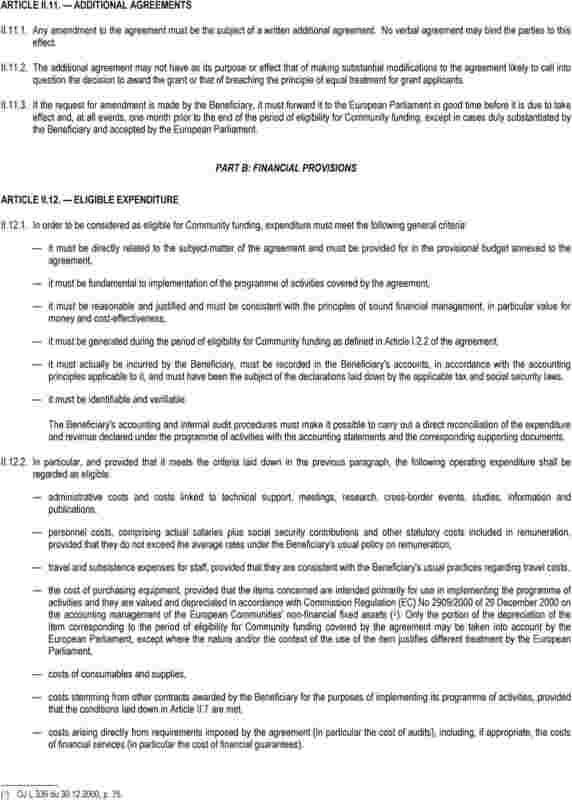 A copy of the grant award agreement is annexed to these rules (Annex 2). The agreement must be duly completed and signed by the two parties within 30 days following the Bureau decision referred to in Article 4. 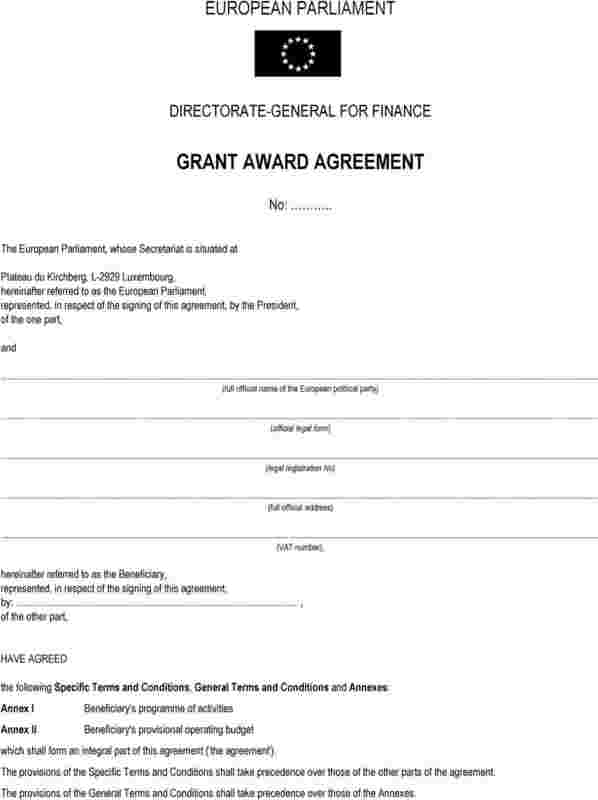 The wording of the grant award agreement shall not be thereafter amended. a second instalment, bringing the total pre-financing to no more than 80 % of the maximum amount of the grant laid down in Article I.3.2 of the grant award agreement, to be paid to the beneficiary at its request. 2. The balance shall be paid once the period of eligibility for Community funding has come to an end, on the basis of the expenditure actually incurred by the beneficiary in implementing the programme of activities. 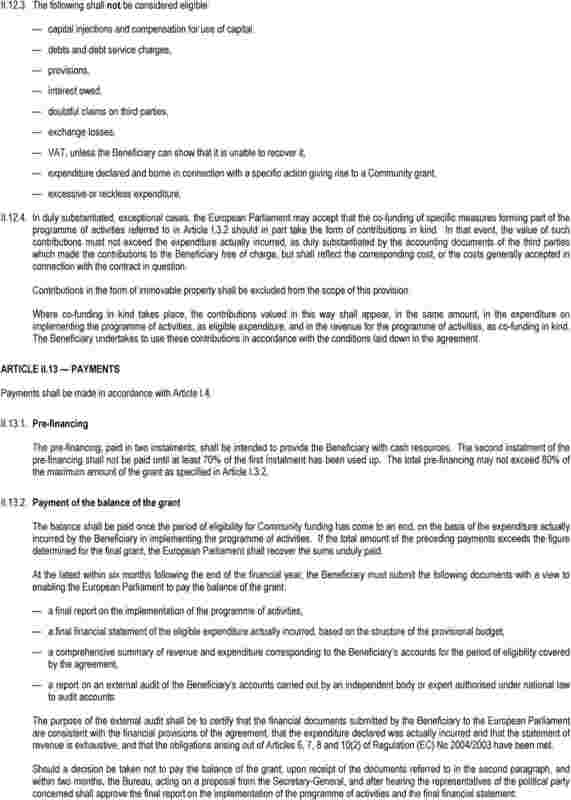 If the total amount of the preceding payments exceeds the figure determined for the final grant, the European Parliament shall recover the sums unduly paid. a report on an external audit of the beneficiary's accounts carried out by an independent body or expert authorised under national law to audit accounts. 4. 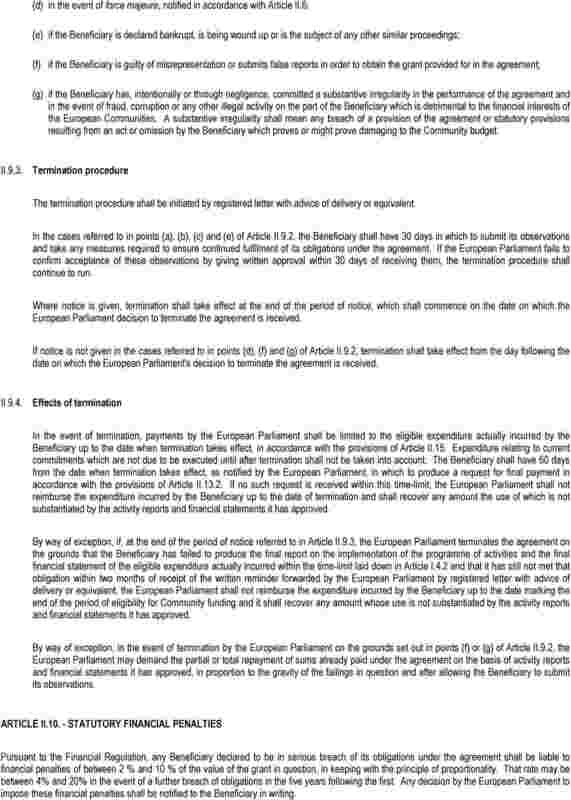 The purpose of the external audit shall be to certify that the financial documents submitted by the beneficiary to Parliament are consistent with the financial provisions of the grant award agreement, that the expenditure declared was actually incurred, that the statement of revenue is exhaustive, and that the obligations arising out of Articles 6, 7, 8 and 10(2) of Regulation (EC) No 2004/2003 have been met. 5. Upon receipt of the documents referred to in paragraph 3, and within two months, the Bureau, acting on a proposal from the Secretary-General, shall approve the final report on the implementation of the programme of activities and the final financial statement. The Bureau may ask the beneficiary to supply supporting documents or any further information it regards as necessary to enable it to approve the final report and the final financial statement. The beneficiary shall have 15 days in which to submit the supporting documents concerned. After hearing the representatives of the political party concerned, the Bureau may reject the final report and the final financial statement and call for the submission of a fresh report and a fresh financial statement. The beneficiary shall have 15 days in which to submit a fresh report and a fresh financial statement. Should Parliament not respond in writing within the two-month period referred to above, the final report and the final financial statement shall be deemed to have been approved. 6. The beneficiary shall notify Parliament of the amount of interest or equivalent benefits generated by the pre-financing received from Parliament. The notification must be forwarded with the application for payment of the balance which settles the pre-financing procedure. That interest shall be the subject of a recovery order issued by the Secretary-General or his delegate. 1. 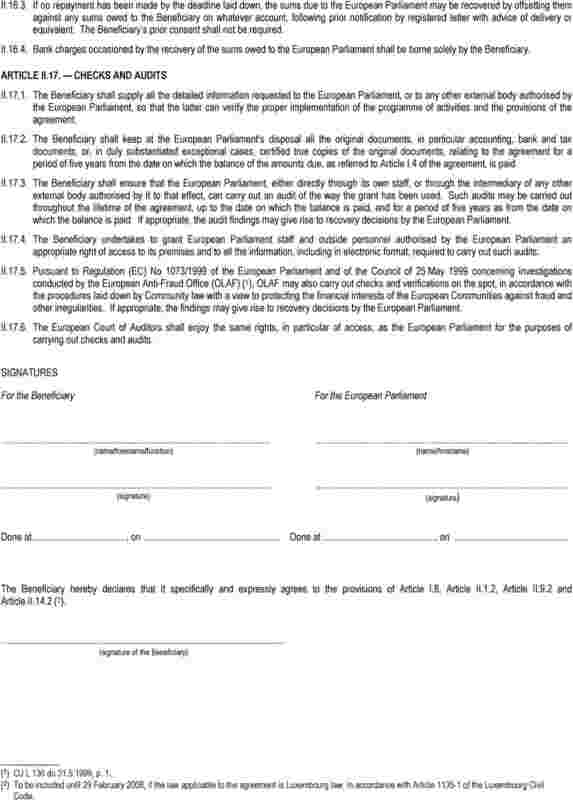 Irrespective of the information obtained subsequently in connection with the checks and audits, after hearing the representatives of the political party making the request to be heard, the Bureau shall determine the amount of the final grant to be awarded to the beneficiary on the basis of the documents referred to in Article 6(3) which it has approved. 75 % of the eligible expenditure actually incurred. 3. 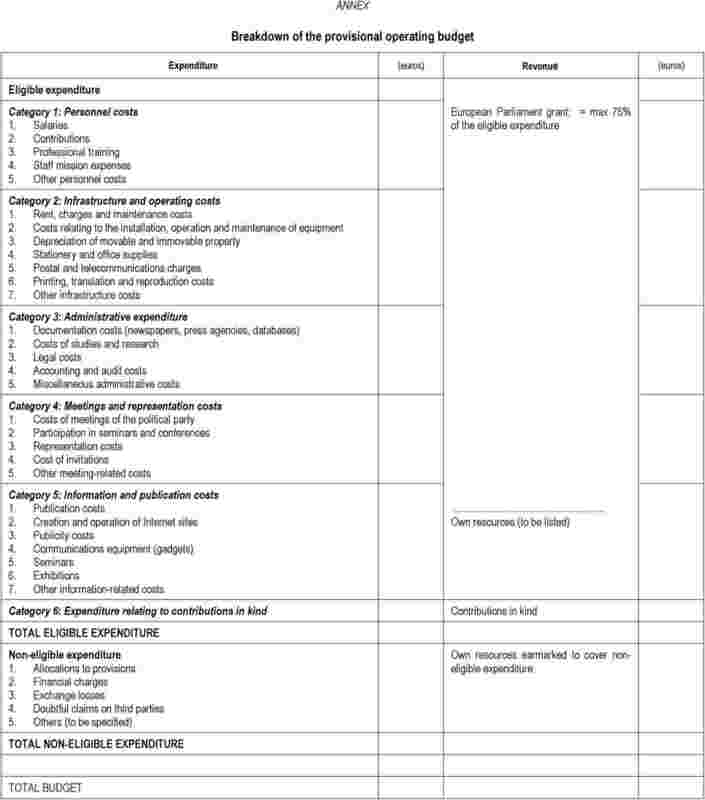 The grant shall be limited to the amount needed to balance revenue and eligible expenditure in the operating budget of the beneficiary which implemented the programme of activities and under no circumstances shall it produce a profit for the beneficiary, pursuant to Article 165 of the regulation laying down detailed implementing rules. Any surplus shall give rise to a corresponding reduction in the amount of the grant. 4. On the basis of the amount of the final grant determined in this way and the cumulative amount of the payments previously made under the grant award agreement, the Bureau shall lay down the amount of the balance to be paid, which shall be equal to the amounts still due to the beneficiary. If the cumulative amount of the payments previously made exceeds the amount of the final grant, the Secretary-General or his delegate shall issue a recovery order in respect of the excess amount. should one of the circumstances described in Article 93 or 94 of the Financial Regulation arise. Before taking a decision, the Bureau shall give the beneficiary the chance to comment on the irregularities established. 1. If amounts have been unduly paid to the beneficiary or if a recovery procedure is justified under the terms of the grant award agreement, the beneficiary shall repay the amounts concerned to Parliament, in accordance with the terms and by the deadline laid down by Parliament. 2. Should the beneficiary fail to make the repayment by the deadline laid down by Parliament, the latter shall charge on the sums due late-payment interest at the rate laid down in Article II.14.3 of the grant award agreement. The late-payment interest shall cover the period between the deadline laid down for repayment, exclusive, and the date on which Parliament receives full repayment of the sums due, inclusive. 1. The regular verification pursuant to Article 5(1) of Regulation (EC) No 2004/2003 shall be carried out by the Secretary-General. 2. The beneficiary shall supply all the detailed information requested to Parliament, or to any other external body authorised by Parliament, so that the latter can verify the proper implementation of the programme of activities and the provisions of the grant award agreement. 3. The beneficiary shall keep at Parliament's disposal all the original documents, in particular accounting, bank and tax documents, or, in duly substantiated exceptional cases, certified true copies of the original documents, relating to the grant award agreement for a period of five years from the date on which the balance of the amounts due, as referred to in Article I.4 of the grant award agreement, is paid. 4. The beneficiary shall facilitate the performance by Parliament, either directly by Parliament staff or by any other external body Parliament has authorised to that effect, of an audit of the way the grant has been used. Such audits may be carried out throughout the lifetime of the grant award agreement, up to the date on which the balance is paid, and for a period of five years as from the date on which the balance is paid. If appropriate, the audit findings may give rise to recovery decisions by the Bureau. 5. 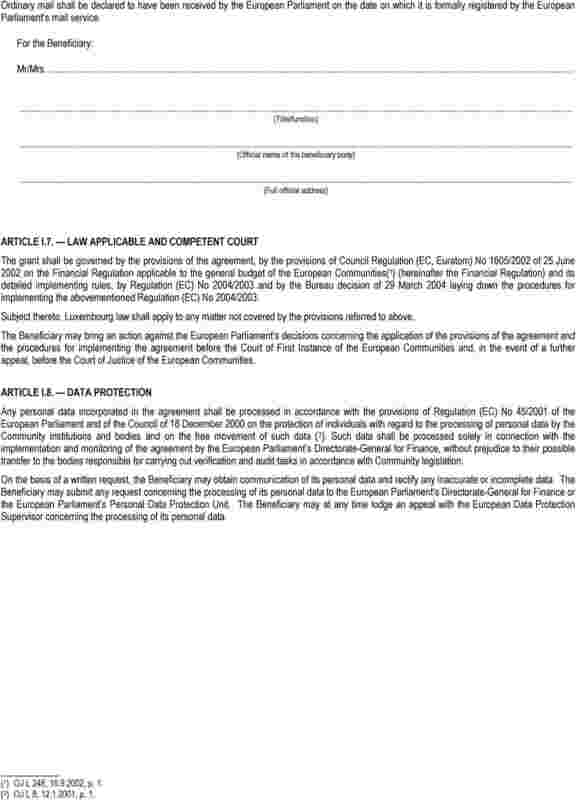 Each grant award agreement shall expressly provide for auditing by the European Parliament and the Court of Auditors, on the basis of records and on the spot, of the political party at European level which has received a grant from the general budget of the European Union. 6. Pursuant to Regulation (EC) No 1073/1999 of the European Parliament and of the Council of 25 May 1999 concerning investigations conducted by the European Anti-Fraud Office (OLAF) (5), OLAF may also carry out checks and verifications on the spot, in accordance with the procedures laid down by Community law with a view to protecting the financial interests of the European Communities against fraud and other irregularities. If appropriate, the findings may give rise to recovery decisions by the Bureau. 1. On a proposal from the Secretary-General, the Bureau may grant political parties at European level technical assistance, in accordance with the Bureau decision of 14 March 2000 governing the use of Parliament's premises by outside bodies, as amended by the decision of 2 June 2003, and any other form of technical assistance provided for by subsequent rules. The Bureau may delegate to the Secretary-General the power to take certain types of decisions concerning the granting of technical assistance. 2. Each year, within three months following the end of the financial year, the Secretary-General shall submit to the Bureau a report setting out details of the technical assistance provided by Parliament to each political party at European level. The report shall then be published on Parliament's Internet site. the amount awarded and the proportion of the beneficiary's total operating budget covered by the funding. 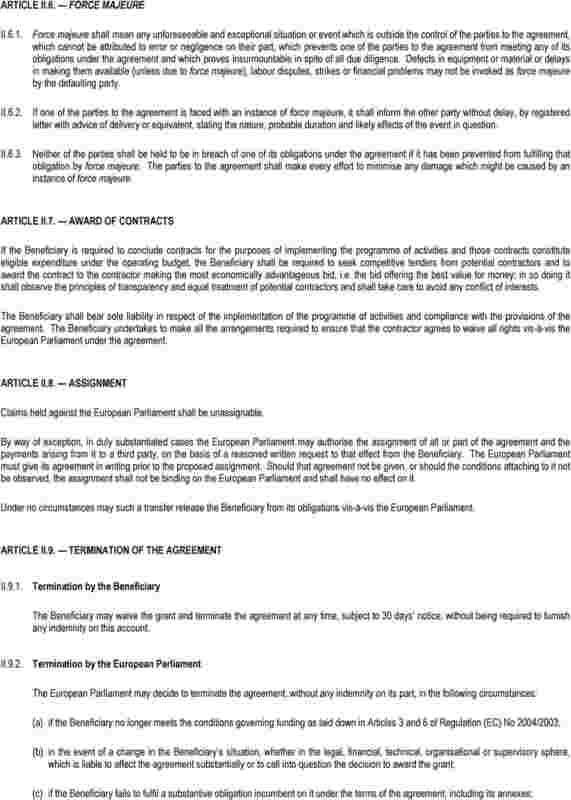 Decisions taken pursuant to these rules may be the subject of an appeal to the Court of Justice of the European Communities or the Court of First Instance of the European Communities, in accordance with the conditions laid down by the Treaty. 1. 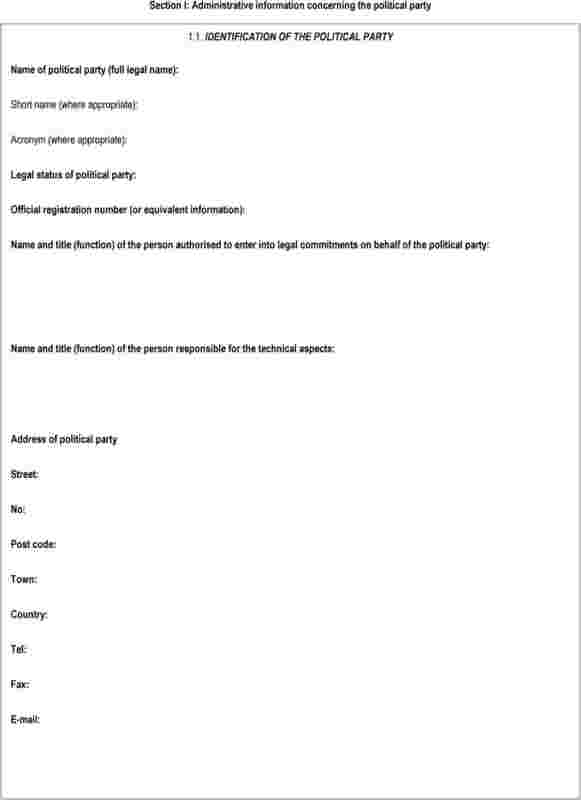 The date given in Article 3(1) of these rules shall be replaced by 23 July 2004 and the date given in Article 4(2) by 16 September 2004. 2. 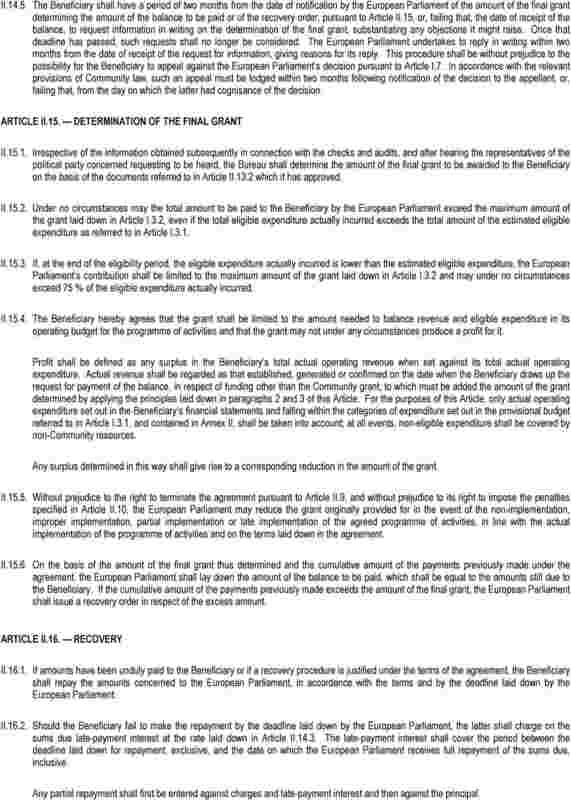 By way of derogation from Article 6(1) of these rules, a single pre-financing instalment of 80 % of the maximum amount of the grant laid down in Article I.3.2 of the grant award agreement shall be paid within 15 days following the signing of that agreement. Before 30 September 2005 the Secretary-General of Parliament shall submit to the Bureau a report on the implementation of these rules. 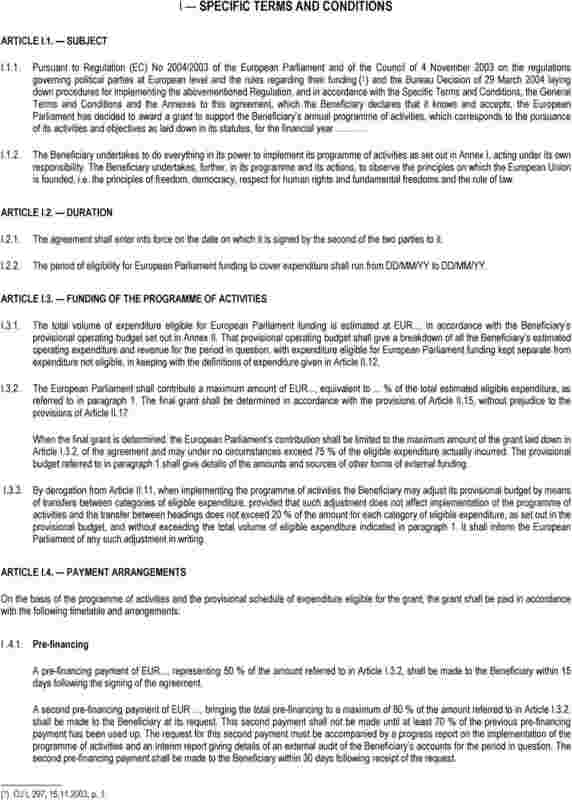 If appropriate, that report shall set out any proposed changes to be made to these rules and to the arrangements for funding European political parties as laid down by Regulation (EC) No 2004/2003. 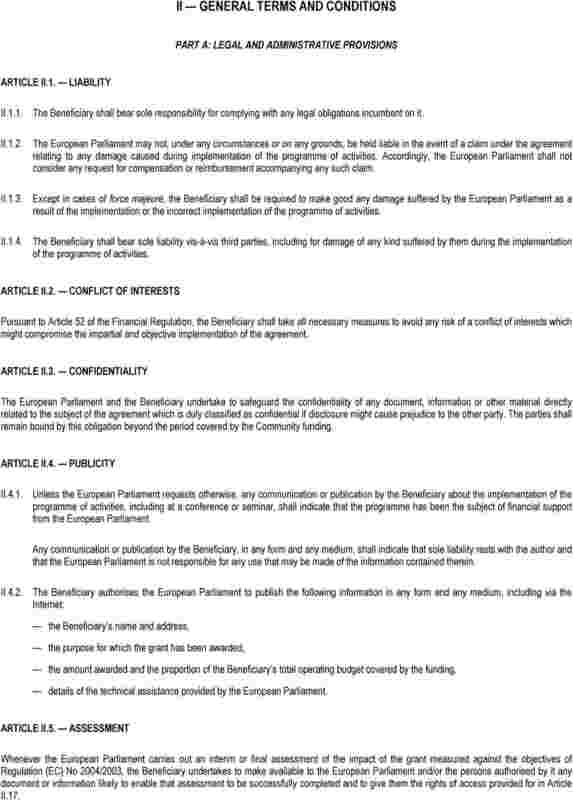 These rules shall enter into force on the day following their publication in the Official Journal of the European Union. (1) OJ L 297, 15.11.2003, p. 1. (3) OJ L 357, 31.12.2002, p. 1. (4) OJ L 336, 30.12.2000, p. 75. (5) OJ L 136, 31.5.1999, p. 1.